Fast Lane offers a complete range of VMware Authorized Training. Fast Lane provides a unique breadth and depth of training that spans the areas of sales training, basic technology, advanced technology, and multi-vendor training based on industry best practices that use VMware technology. 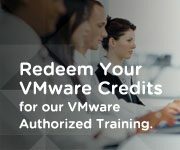 Select from the Authorized VMware Training classes below or from our unique offerings to enroll at a location of your choosing. Contact us today, if you have questions and require more details.